An independent variable is an entity whose presence determines the change in a dependent variable. In the world of math and science, an independent variable is something you have control over, something you can choose and manipulate. Unfortunately for Islanders’ head coach Jack Capuano, this is the concept that is going to cost him his job. The New York Islanders are in a full blown tail spin. Heading into their game against the San Jose Sharks (12/10), the team is in the midst of a 10 game losing streak, with their last win dating back to November 16th (Wings), and their last ROW win going all the way back to November 12th against the Predators. Yes, the team has been playing shorthanded for some time now, losing 72 man games due to injury through 31 games, but even the most pessimistic Isles’ fan couldn’t have imagined a decline so sharp. There are many places to point the finger during the team’s downward spiral. Special teams have been terrible, secondary scoring has become non-existent, and the defense and goaltending have been a “choose your own adventure book” on a nightly basis. When there’s this many issues on a team, it comes down to simple math and science. It’s easier to fire one man than the whole team. Prior to the team’s recent skid, GM Garth Snow’s rebuild has had its ups and downs, but through it all, the franchise has stayed true to their draft and develop mantra. True championship teams are built on homegrown talent, and over the last few seasons, Snow has invested in players who he believes are the future of the club. Sure everyone knows John Tavares, but multiyear deals such as the one over the summer to forward Josh Bailey have cemented the Islanders core. The Islanders have made their bed, now they have to sleep in it. Isles’ nation have been clamoring for Garth Snow to make a significant move. But realistically, who do the Islanders currently have that other teams value AND Snow is willing to deal? Taking a quick look at the roster, there are the untouchables (Tavares, Okposo, Hamonic), as well as the top prospects (Nelson, Strome, Pulock, Reinhart). These players are the building blocks to Brooklyn. The second tier of long term Isles (Grabner, Bailey, Clutterbuck) were simply over valued at the time of their contracts. Although respectable in their own right, Garth Snow knows it would be a difficult task unloading these contracts to any team given the inconsistencies of each player. 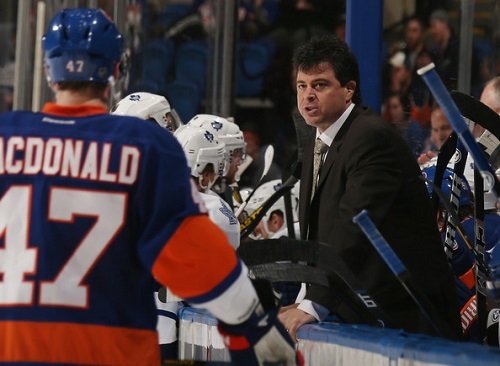 Islanders’ head coach Jack Capuano is currently on the hottest seat in the NHL. Trade a veteran? Once healthy, Lubomir Visnovsky & Evgeni Nabokov would get a good return, but it’s tough to see Garth Snow giving away his most veteran, experienced players on the team, at least during the season. The most interesting pieces are Andrew MacDonald & Frans Nielsen. A well rounded two way center with two respectable years left on his contract (2.75 mil per), Nielsen would add huge value down the middle to any contending team. I think this is a long shot, but with two young centers in the system in Strome and Nelson, I wouldn’t be shocked if Snow decided to turn Nielsen around for a legit defenseman. MacDonald is in a contract year and would add depth on a team’s blue line, but I don’t see him parting ways with the team after he was given the “A” this season. We’ll save the Thomas Vanek issue for another article, but the point at the end of the day is the Islanders that hit the ice against the Sharks on 12/10 (ok, we’ll use 12/12 against the Coyotes – Stome’s first game with team) will be very similar to the team you see next year. There simply aren’t that many moving parts within the organization. There’s a good chance that barring anything drastic, something Garth Snow rarely does, the main differences on next year’s team could be no Thomas Vanek and someone new in net. With Pierre-Marc Bouchard clearing waivers, NHL teams have shown where they value the Islanders’ acquirable talent. Garth Snow’s hands are tied and Jack Capuano is going to take the fall. It seems that Capuano know this as well. Over the last two weeks, his post-game press conferences suggest a beaten man, one who knows he’s hit the wall. He’s maxed out his tutelage with the current roster, and the players aren’t going to change. The New York Islanders need a new voice. Garth Snow may not want to fire his head coach, but it’s getting to the point where it may be the only possibility.